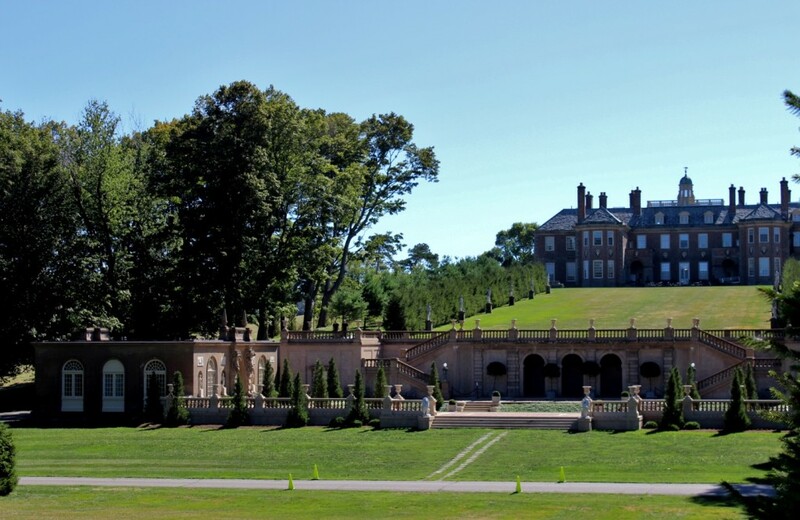 The great house of the Crane Estate on Castle Hill in Ipswich, Massachusetts, was built for the Chicago industrialist Richard Teller Crane, Jr. and his family. 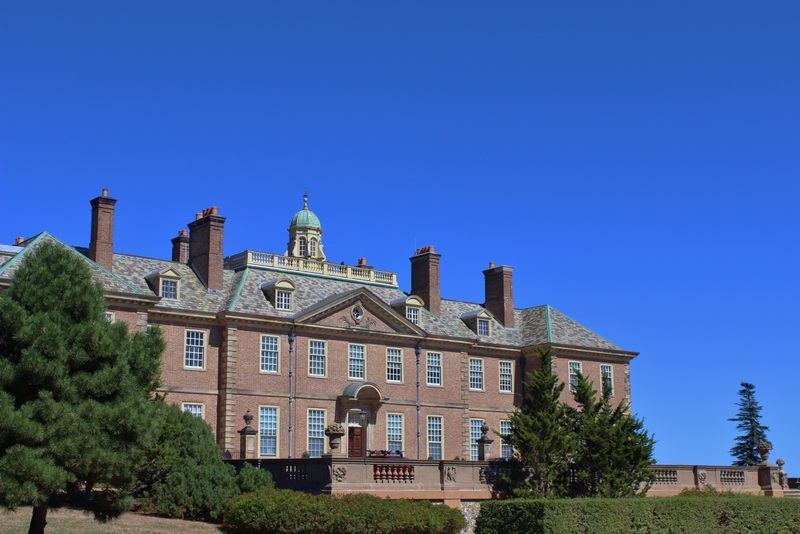 It was designed by architect David Adler in a 17th century English revivalist style using pink Holland Brick trimmed with Indiana limestone and a blue-green natural slate roof. 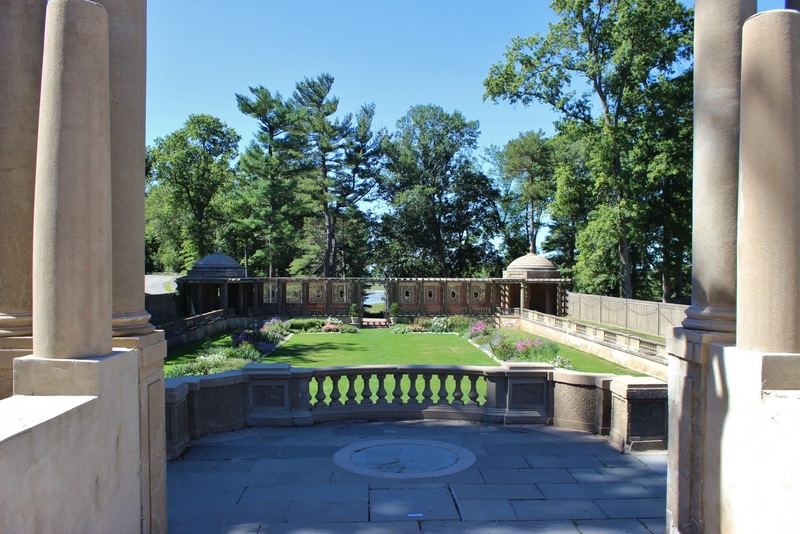 The parkland and gardens were originally designed by the famous Olmsted Landscape firm of Boston with important additions by Arthur Shurcliff and Harriet Risley Foote. The grand and handsome house sits atop a 165 acre drumlin enjoying a 360° view of the surrounding low-lying marsh bordering Ipswich Bay and far out into the Atlantic Ocean. I was there on a Monday in early September when the house was closed to tours and the summer season gone by, leaving me in blissful peace and quiet. As you can see the day was splendidly clear with an effervescent sparkle. 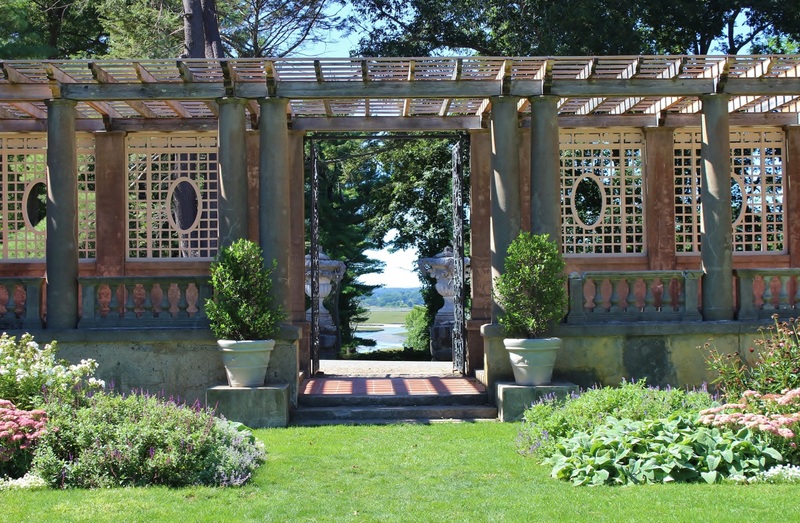 On the end pier of this balustrade you can see a finely sculpted crane with wings spread referencing Mr. Crane’s family name and staking a claim to his domain (2,100 acres) that extends beyond the proud specimen trees of the parkland out to the winding Essex River draining the extensive tidal marsh. 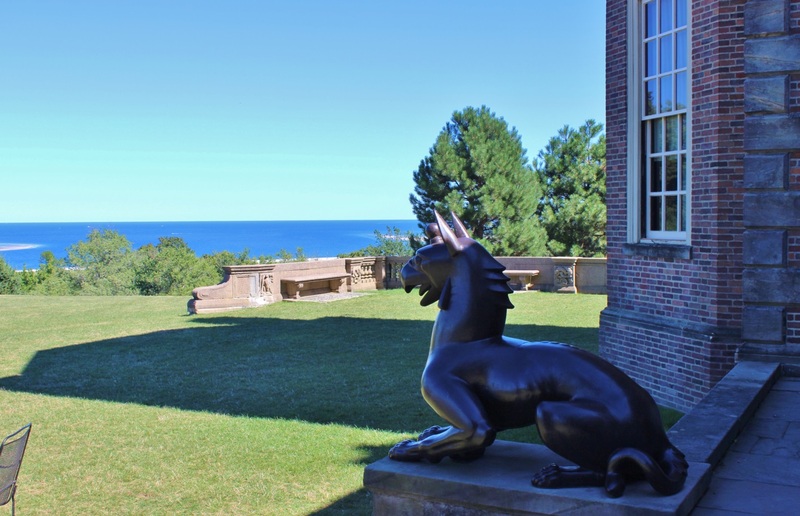 Ferociously guarding the ocean side terrace of the Big House are two lead Griffins finished with bronze patina that were sculpted by Paul Manship (Prometheus fountain, Rockefeller Center NYC). They seem to be snarling at the expansive Atlantic from which winter storms howl. 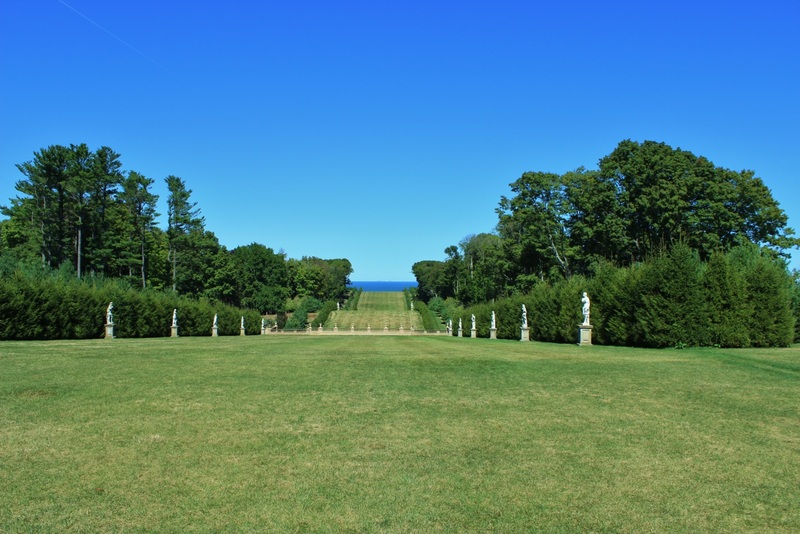 The spectacular formal allée leading from the Big House down to Ipswich Bay is half a mile long, 160 feet wide and was designed by Arthur Shurcliff. The Crane Estate is one of 112 sites now owned and maintained by the Trustees of the Reservations, the original public land trust from which the National Trust of Great Britten was patterned. It was the idea, ideal and long labor of Charles Eliot of Boston who proposed the establishment of what would become the first private nonprofit conservation organization of its kind in the world. 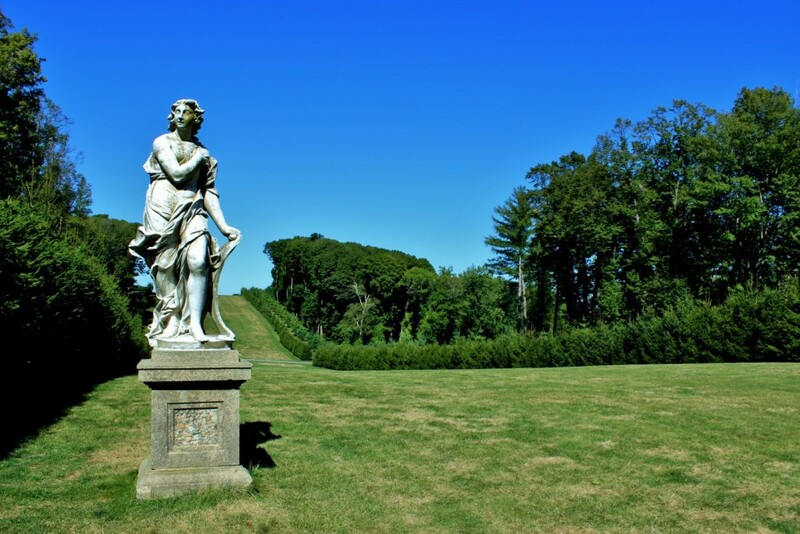 The recent 1.5 Million dollar restoration of the allée is nothing short of monumental with 700 newly planted evergreen conifers demarcating the carefully clipped lawn beyond which mature hardwood trees stand tall on either side. 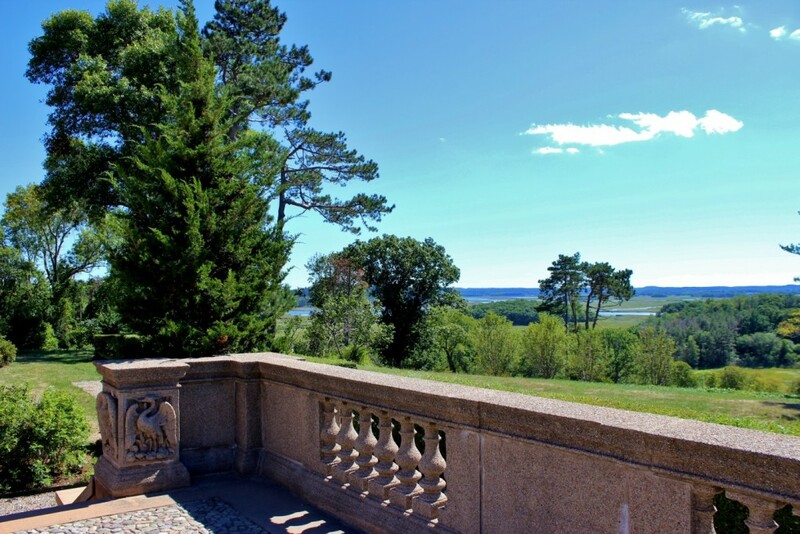 Two lines of marble statues depicting various classical characters decorate this grand passage and although my photograph does not give us the distant detail, when I took this view I could see the Isles of Shoals off the coast of New Hampshire 26 miles away. Now here is something quite remarkable, the Casino, a group of buildings originally incorporating a salt water swimming pool (now a central croquet lawn) surrounded by formal terraces corralled by balustrades punctuated with urns and classical statues in niches and other sculptural decorations, all on such a grand scale I just want to applaud such extravagant audacity! The Casino complex consists of two villas: one housing a ballroom, the other providing “bachelors’ quarters” for the young men who visited with Mr. and Mrs. Crane and their two daughters. Today there is a café with a pool table, games and a working fireplace with gracious out door lounging furniture on the terraces of two levels connected by stately staircases. The most remarkable aspect of Surcliff’s design is the placement of the Casino in a wrinkle or step down of the descending vista much like a “Ha-ha” of an English country estate where a similar dip in the landscape acted as a hidden fence to keep the grazing livestock at bay. Which is to say that from above at the terrace of the big house you not see the Casino complex, only a line of the urn-decorated balustrade. From the door of one of the twin villas we look across the croquet lawn towards the ballroom villa. Ain’t it grand? 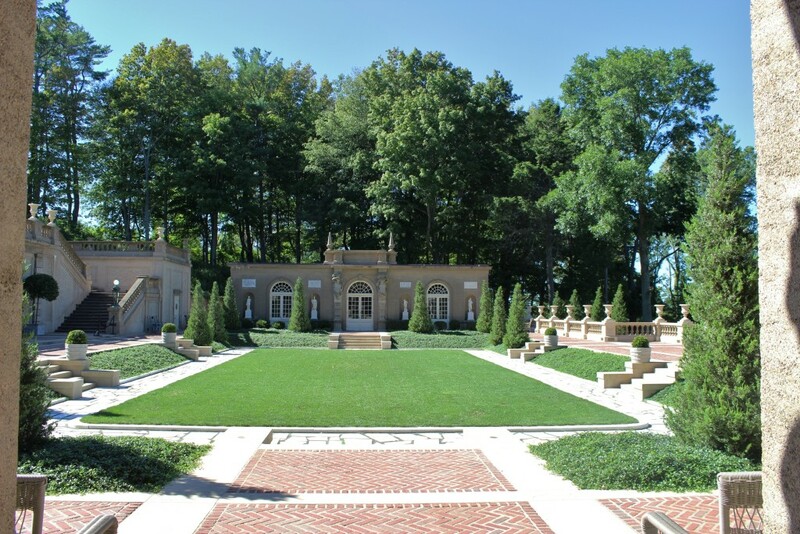 The newest restoration to the Crane Estate is the sunken Italian garden. The afternoon when I was there I had the place to my self and I half expected to see the Crane family having tea in the one of the elegant pavilions. Here is a view of the sunken Italian garden newly restored and replanted. 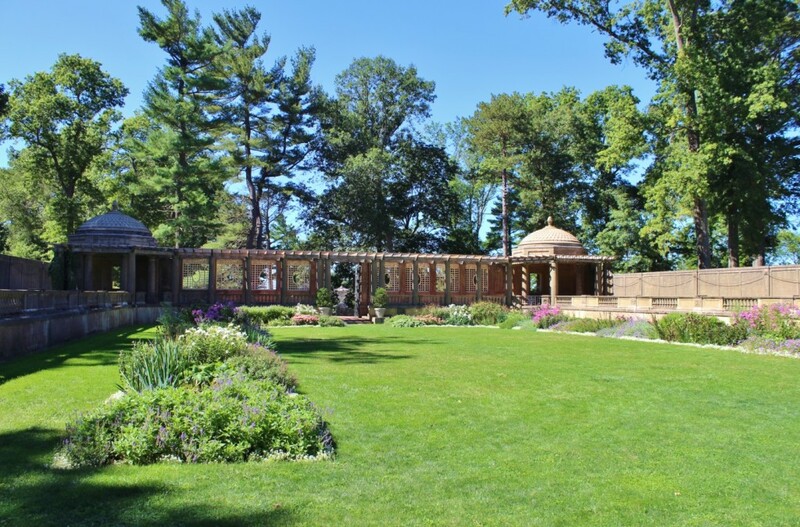 This garden dates from the original design of the estate and was designed by the Olmsted Landscape Firm. Inside the Italian garden the wide perennial borders are lush with blossoms even at the beginning of September. The two tea pavilions are connected by a logia roofed with sturdy wooden beams supported by elaborate trellis work. Through the open doors of scrolling wrought iron an enticing view of Ipswich harbor can be seen, looking towards Plum Island. I am particularly fond of the oval “windows” piercing the trellis work that frame picturesque views as you walk beneath the logia. This entry was posted in The Great House on Castle Hill, Visiting Beautiful Gardens on November 29, 2016 by ioryallison3.